Using the spiralizer, create "noodles" with the sweet potatoes. This should yield at least 4 cups. Reserve. In a medium bowl, combine alfredo sauce, pesto sauce, ½ cup mozzarella cheese, salt, pepper and 2 tablespoons parsley. Mix until well combined. Add sweet potatoes, onion and garlic. Toss until "noodles" are completely coated. Coat an 8x8-inch baking dish with cooking spray. Transfer mixture to dish and spread evenly in pan. 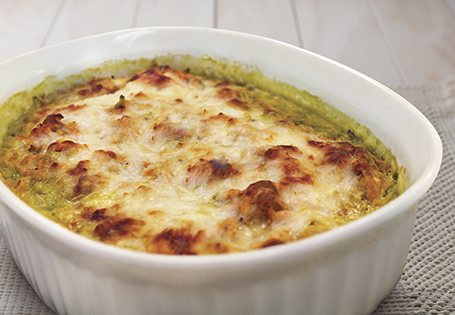 Top with remaining ½ cup cheese and remaining 1 tablespoon parsley. Bake for 30 minutes or until golden brown. Let cool 15 minutes before serving.